For many users, the quality and accessibility of the iPhone camera means that it is the only camera we need on a regular basis. It may be about to get a whole lot better, too, according to a patent application published by Apple on Thursday — describing a new “super-resolution” mode. What makes the patent interesting (apart from that it promises higher quality images) is that it suggests that picture resolution could be ramped up without needing more megapixels. How would this work? By using an an optical image stabilization (OIS) system which takes multiple photo samples in very rapid succession, with each one from a slightly offset angle. These images are then fed into an image processing engine which creates a patchwork image in super-resolution. 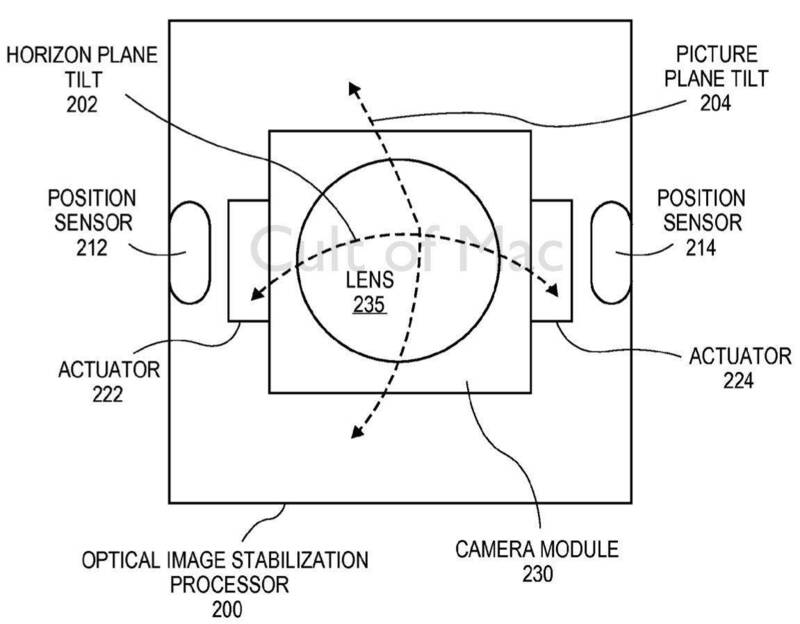 According to one embodiment described in the patent application, the system features a camera, an actuator for OIS positioning, a positioning sensor, inertial sensor, OIS processor and a super-resolution engine. A central processor — like the A7 system-on-chip found in the iPhone 5s — controls the mechanism and is used to ferry data between different components. As the top image shows, how this might be practically implemented within an iOS device could be the option of a super-resolution mode within the basic camera app. When the camera shutter is activated, the iPhone would then take a flurry of multiple images like the iOS 7 burst mode supported by the iPhone 5s. 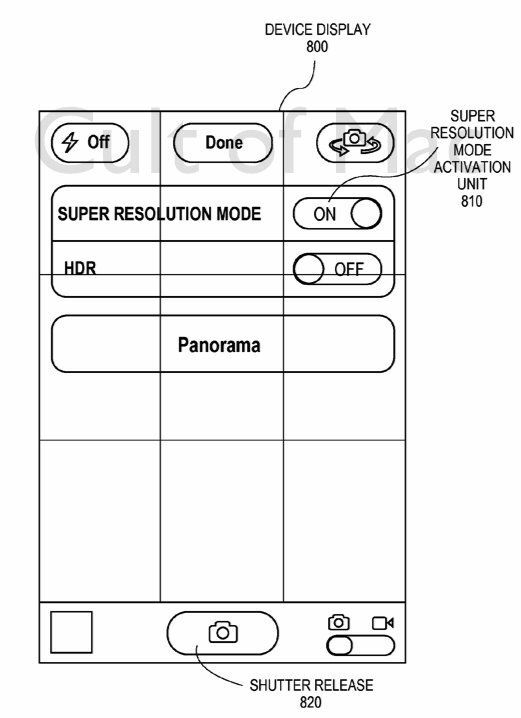 Of course, as with all patent applications filed by Apple, there is no guarantee that the super-resolution mode will ever make it into an actual product. 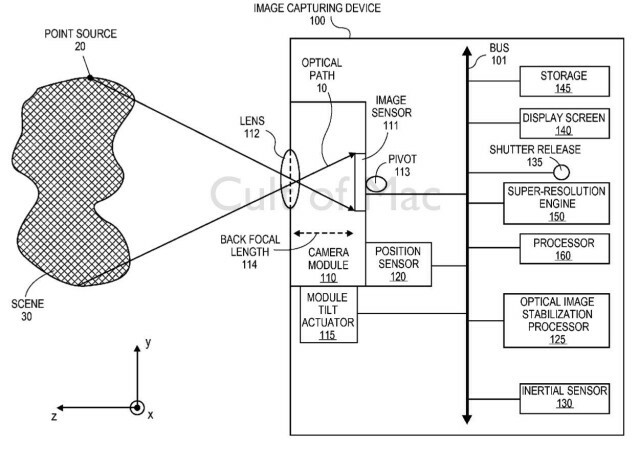 The application was filed by Apple in November 2012, and names Apple’s Camera Systems Engineering Manager Richard L. Baer and Camera Software Engineer Damien J. Thivent as its inventors.